Day Two of the Regional Convention of the Church of God in Anderson, Indiana, was met with classic camp meeting thunderstorms and classic camp meeting worship and fellowship. But those who gathered in the expanse of Madison Park Church of God on Wednesday, June 22, were also met with bold exhortation and moments of intense introspection. We were challenged to take a hard look at ourselves as individuals, local churches, and as a movement. Though uncomfortable at times, we were invited to take the dare to get off our donkeys, get our hands dirty, and carry out the radical task of reclamation. Photo: Reggie McNeal at Reclaim 2016 Anderson. Are we still a movement, or have we atrophied? Is our end game to build bigger churches, or are we aiming to advance the kingdom of God? Are we more concerned with programs and events than transformational discipleship? 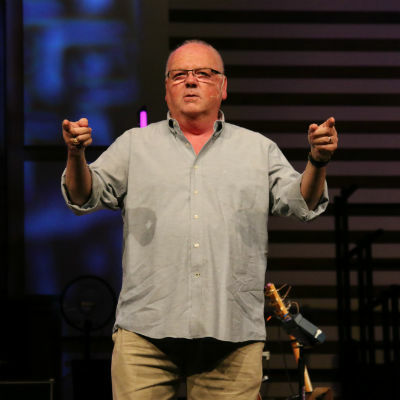 Every speaker that graced the stage on the second day of Reclaim 2016 in Anderson tasked the Church of God with reevaluating our purposes, priorities, and pursuits. From Ben Hardman’s against-the-grain approach to discipleship, to Arnetta McNeese Bailey’s shift of focus from the church to the Head of the church, to Steve Arterburn’s words of healing for the soul and Reggie McNeal’s no-uncertain-terms, the experience was extraordinarily catalytic. International mission-sending opportunities were celebrated on Wednesday with the commissioning of Abby and Jason Torgeson to Costa Rica, as well as CarolAnn North to southeastern Asia. Rebecca New Edson was honored as her season of leadership over the General Assembly comes to a close. Ann Smith and Andrea Baker offered words of wisdom to the women of the Church of God gathered for the Christian Women Connection luncheon who, to put into practice neighborhood reclamation, brought nonperishable food items to donate to Operation Love—a local community outreach. Interspersed between times of teaching, fellowship, and taking advantage of incredible deals at the Warner Press warehouse sale, Alanna Story led the saints in powerful worship. The closing service of the Anderson Regional Convention featured Alanna Story’s fresh take on classic hymns, all backed by a choir. You had to be there. But if you weren’t, Philadelphia is your next opportunity. The third and final Regional Convention this year is September 27–29 at New Covenant Church in Philadelphia, Pennsylvania. Register online at www.chogconvention.org. This entry was posted in All Church of God, Church of God Convention and tagged Anderson, camp meeting, Church of God, Day 2, Indiana, Reclaim 2016, regional convention, Wednesday. Bookmark the permalink.